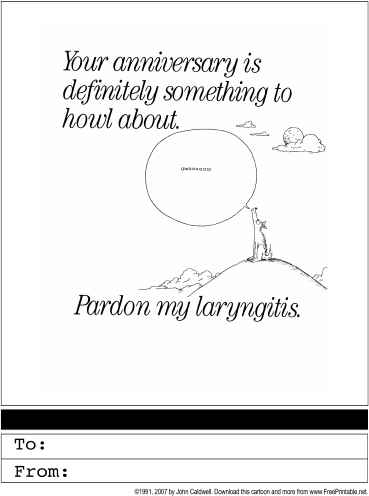 A wolf with laryngitis howls about your anniversary on this funny printable card. This Greeting Card is available in two versions: a free, ready-to-use version and a $4.00 Premium version. The free version is available in Acrobat (.PDF) format: just download one, open it in Acrobat (or another program that can display the PDF file format,) and print. The corner of the free version is watermarked with the FreePrintable.Net URL. The $4 version is not watermarked with the URL. With it, you get the file in both PDF and Microsoft Word (.DOC) formats. The Word version can be customized with your name and the recipient's name. You can pay using your PayPal account or credit card. You'll be able to download the customizable greeting card within moments.